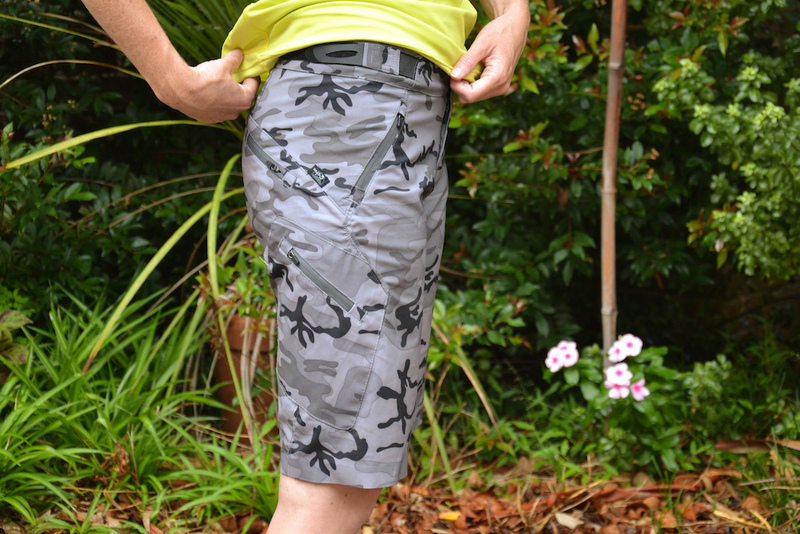 In the words of Zoic, the Navaeh short is aimed at 'ladies who launch.' 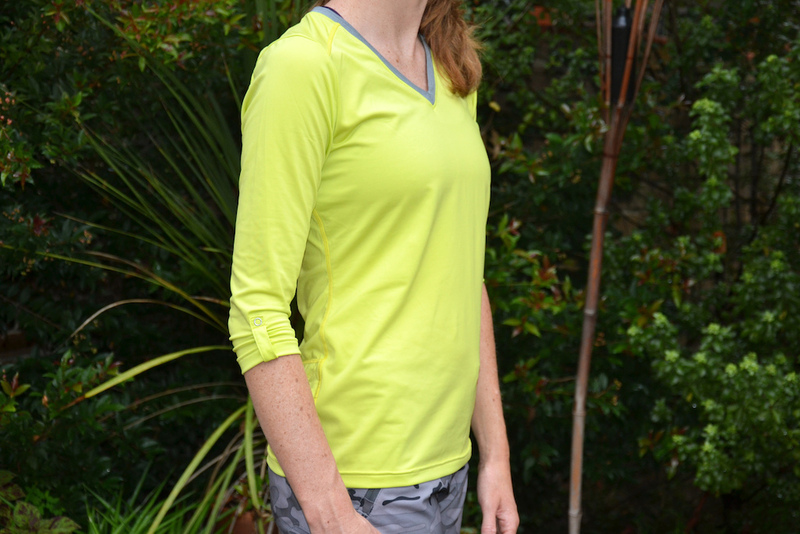 The Navaeh's are made from a lightweight stretch fabric and are cut for all-mountain performance. The shorts contain two front pockets, a stealth zip rear pocket and two leg pockets that have seam taped zippers which are designed to stay locked while you ride. In addition, there's also a tech pocket for a music player with a headphone cord control grommet and loop. The front waistband has a double snap and zip fly closure and there are elastic and velcro side adjusters to help you get the best fit out of the shorts. The Navaeh's come with an 11 inch inseam, which is designed to fall at the knee. The Navaeh's also includes an IPL Essential liner with a women's specific chamois contour that includes Z-Wick moisture management. The fusion inseam gusset is designed to provide a nice range of motion and reduce seat hang ups. There is no tag in the shorts to eliminate irritation and the stitch free leg hem is designed with the same goal in mind. 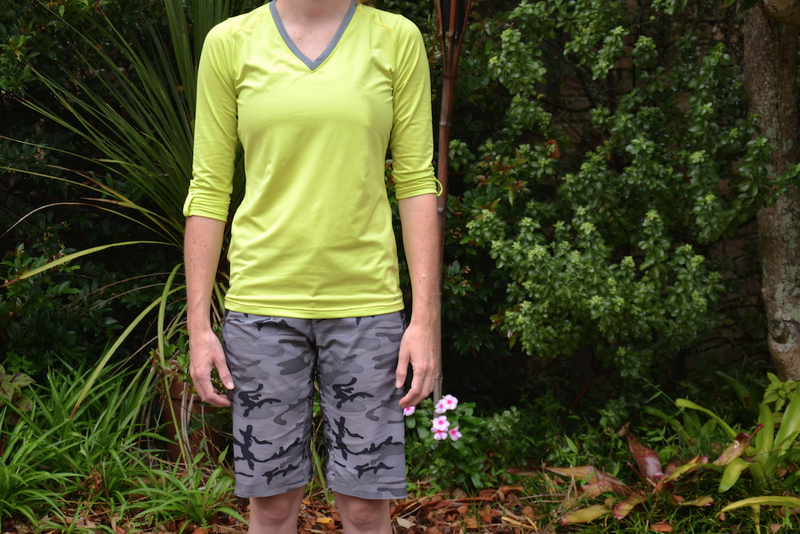 The Navaeh short is made from a Polyester/Spandex mixture and retails for $95 USD. The Navaeh shorts have the construction of a tailored suit; expect contoured lines and a comfy fit. The Vivid Jersey is simple with a little bit of flare at the elbows to keep things interesting. A lot of care and thought has gone into the design and construction of what is simply a nice and neat little kit. The Navaeh shorts are well constructed, and in putting them on you can appreciate the design elements that have been incorporated into them. Unlike some shorts that feel like a flappy burlap sack when you pull them up, the Navaeh slides up and over the hips and pop neatly into place. The higher waistband and contoured hip and backside means everything sits nicely and you can further modify the fit with the elastic/velcro waistband straps on the sides of the short. When riding, the close fitting construction meant there were no seat hang ups, and the range of movement provided was more than adequate coupled with a barely-there kind of feel. The lightweight material was especially appreciated on the sweltering hot days I rode in them, and combined with the really short leg of the essential liner, the level of breathability of comfort was like a dream come true. Maybe she gave it to someone. Which would rule out it being my wife! Anyone else notice that a majority of the products that are reviewed and on the main page are women's riding shorts? I don't mind because it produces comments like the ones above. Well done, especially properp hahaha. Let's just hope they don't review any helmets. I've got some Zoic clothing and it's bloody good. Really comfy to ride in and it's very strong for how lightweight the fabric is. does anyone else ride in bball shorts or cut off jeans like me? im too cheap. I ride in jeans pretty often, as long as I'm not pedalling a lot or its not hotter than hell. I buy one pair of bike-specific shorts or pants a season lol. I have a few pair of cargo shorts in the rotation, one pair being of the swim variety, and 2 pair of bike specific shorts. it sounds fine, but if you take a spill, you are for sure putting holes in your shirt and in your jeans, but i can take numerous spills wearing my TLD jerseys and my TLD or Fox or Alpine (aka just MTB specific clothing) and it will come out of the tumble just fine. different way of building it and different materials used matter a lot. I have a bunch of Spectrum techwear shorts from when they were going out of business. I LOVE how they look like normal clothes but they're not tight on my hips while pedaling, and the high crotch keeps them from hanging up on the saddle when i'm behind it. They've held up for 6-7 years, too. Wish i could buy some more... casual bike clothes are totally worth the expense. Good jeans can withstand some abuse, dirt jumpers and freeriders wouldn't wear them if they didn't! It's all good what you wear man just as long as you get out and ride. I always ride in cargo shorts or heaven khakis. Long jeans do too much abuse on my amazing mane of leg hair. Not diggin' the camo and I'm 99% sure my lady would say the same. She would like the Novelty colorway Zoic has available though. They should make the Naveah in that print. The ginger girl looks hot. I know a girl whos name is heaven backwards. She has silver teeth. The video of the yoga girl get more comments iam WONDERING why ? only clicked on here to see woman model. was disappointed. You know, they have the internet for that. Turn off Google safe search... Go nuts.